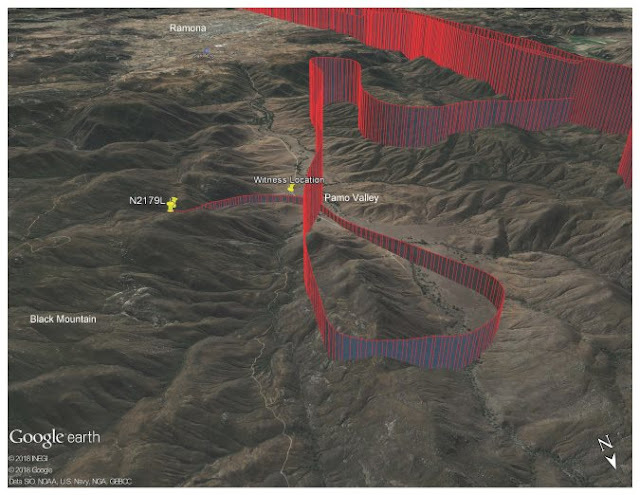 On February 12, 2017, about 1410 Pacific standard time, a Cessna 172S airplane, N2179L, impacted terrain while maneuvering near the Pamo Valley about 5 miles north of Ramona, California. The flight instructor and the student pilot sustained minor injuries, and the passenger was fatally injured. The airplane sustained substantial damage. The airplane was registered to American Aviation Academy, Inc, Gillespie, California, and operated by the company under the provisions of Title 14 Code of Federal Regulations Part 91. Visual meteorological conditions prevailed, and no flight plan was filed for the local instructional flight, which originated from Gillespie Field Airport (SEE), Gillespie, California about 1325. A witness saw the airplane flying northbound from his home located in the Pamo Valley, about 1 mile southwest of the accident site. The witness watched as the airplane turned and flew straight towards his location. The airplane passed over the witness about 100-150 ft above ground level (agl) when he made "eye contact" with the pilot. After the airplane passed by, the witness heard the "full acceleration of the engine" as it flew towards the mountain to the east of the witness's location. He watched as the airplane turned towards the northeast; he then lost sight of it over a ridge. The flight instructor reported that this was his third instructional flight of the day. 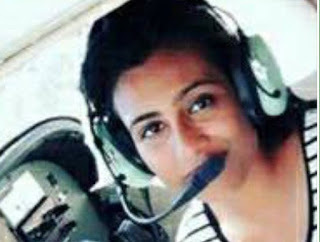 The passenger was a student pilot who joined the flight when her own instructional flight was cancelled. During the preflight of the airplane, the passenger was added to the company's manifest, and she sat in the rear right seat. The student pilot and the flight instructor were seated in the forward left and right seats respectively. The flight instructor reported they performed the usual protocols before the engine start up until prior to takeoff. They departed a practice area about 8 miles north of Ramona and performed flight training maneuvers. After departing the practice area, they performed a simulated engine failure maneuver over Pamo Valley about 1.5 miles west of the accident site. According to the flight instructor, the maneuver was completed at least 700 ft agl, and the student pilot advanced the throttle to full power and turned left about 90° to an east heading, toward rising terrain. The flight instructor stated that the gauges all read normal, but the airplane could not outclimb the rising terrain ahead. He verified that all settings were normal and took over the controls from the student pilot. The flight instructor stated that he could not turn left or right due to the rising terrain on both sides and decided to stay centered over the narrow and wooded ravine that ascended the mountain. He stated that he had no choice but to crash the airplane. He further stated that before impacting terrain, he brought back the throttle halfway then advanced it to full power to cushion the impact with the trees. The airplane came to rest upright. 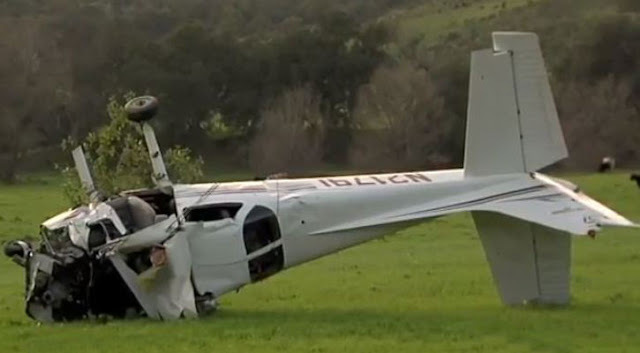 The flight instructor was able to unbuckle his seatbelt but had to cut the student pilot's seatbelt to free him. 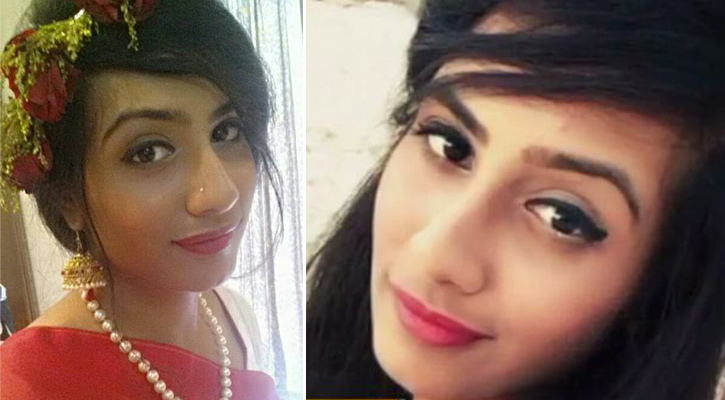 After examining the passenger, he realized that her seatbelt was not latched and that she was fatally injured. First responders arrived on scene about an hour after the accident. According to the student pilot, while flying south over Pamo Valley, the flight instructor told him to turn left toward the east. He looked up and said "mountain, mountain." The flight instructor then took control of the airplane saying, "I have control, I have the plane." The student stated that the airplane was running fine and that there were no power output problems. According to the student, the flight instructor said, "I will show you performance like Big Bear," added full power, leaned the mixture, flew straight for 5 seconds, and then said an expletive shortly before the airplane crashed into the mountain. A personal electronic device was recovered from the airplane and revealed the accident flight track data was obtained from the ForeFlight application on the device. The track data depicted the airplane departing SEE and performing maneuvers between 2,000 and 5,100 ft agl in a practice area about 5 miles west of the accident site. The airplane departed the practice area to the east and made multiple turns over Pamo Valley, descending to about 285 ft agl. The airplane then climbed and turned east entering an area of terrain that rose in front and on both sides of the airplane. The track continued to climb for about 1 minute 5 seconds, about 584 ft, before reaching the accident site. Refer to Figure 1. The flight instructor held commercial pilot and flight instructor certificates with airplane single- and multi-engine land and instrument ratings. He was issued an FAA second-class airman medical certificate on March 30, 2016, with no limitations. According to the operator, the flight instructor had accumulated 954 total hours of flight experience, of which 649 hours were as a flight instructor. He had accumulated 195 hours as an instructor in the accident make and model airplane and had flown 190 hours in the last 90 days. The student pilot had accumulated 71 total hours of flight experience , all in the accident airplane make and model. He was issued an FAA first-class airmen medical certificate on August 24, 2016. The four-seat, high-wing airplane, serial number 17259633, was manufactured in 2004. It was powered by a Continental Motors IO-360-L2A engine. According to the operator, the last 100-hour inspection was completed on February 1, 2017, at which time the engine had accumulated about 1,000 hours since major overhaul and the airframe had accumulated 8,564 hours of total time. The operator reported that the airplane was topped off with fuel before departing on the accident flight and calculated the airplane's weight at 2,363 pounds at the time of the accident. According to the airplane's Pilot's Operating Handbook (POH), when flying at the airplane's maximum certificated gross weight of 2,550 pounds, under standard conditions, with no flaps and full throttle, at 2,000 ft mean seal level (msl) and, 73 knots indicated airspeed, the airplane's maximum rate of climb is 625 ft per minute. At 1353, Ramona Airport (RNM), Ramona, California, elevation 1,395ft, located 5 miles south of the accident site, reported wind 300° at 10 knots, visibility 10 miles or greater, scattered clouds at 3,000 ft agl, temperature 21°C, dew point 8°C, and an altimeter setting of 29.99 inches of mercury. Based on the RNM wind, the climb to the east from Pamo Valley would have had an approximate 10 knot left-quartering tailwind. Local temperature, humidity, and elevation conditions at the time of the accident resulted in a density altitude of about 2,300 ft. The accident site, at an elevation of 1,869 ft, was located on the southeast side of Black Mountain, which has an elevation of 4,051 ft at the summit. The elevations of the surrounding peaks are near 4,000 ft. Examination of the accident site by a Federal Aviation Administration (FAA) inspector revealed that the airplane impacted a large tree in steep terrain. The tree penetrated up through the center of the main cabin floor just behind the front seats and out the roof. The main wreckage remained intact with the exception of the propeller assembly, which separated and was located near the main wreckage. The wreckage was relocated to a secure facility for further examination. The follow-up wreckage examination revealed no evidence of any preimpact mechanical malfunctions or failures. For further information see the Wreckage Examination Summary in the docket for this accident. The County of San Diego, Office of the Medical Examiner, San Diego, California, performed an autopsy of the passenger. The cause of death was blunt force injuries of the head and neck. Injuries: 1 Fatal, 2 Minor. On February 12, 2017 about 1430 Pacific standard time, a Cessna 172S, N2179L, impacted terrain while maneuvering five miles north of Ramona, California. The certified flight instructor (CFI) and student pilot had minor injuries and the rear seated passenger was fatally injured. The airplane sustained substantial damage. The aircraft was registered to and operated by American Aviation Academy, Inc, Gillespie, California, under the provisions of 14 Code of Federal Regulations Part 91. Visual meteorological conditions prevailed and no flight plan was filed for the local instructional flight. The flight originated from Gillespie Field Airport (SEE), Gillespie, California at about 1400. The student pilot stated that he completed a weight and balance calculation, which was signed off by the CFI. After the preflight was accomplished and fuel was added to the airplane, an additional passenger boarded. After approaching the practice area and conducting training near a dirt strip, two consecutive simulated engine failure procedures were accomplished. While climbing out on the last simulated engine failure, the CFI instructed the student pilot to turn left in the direction of east. While in the turn with full power, the student pilot recognized rising terrain and the CFI took over control of the airplane. Subsequently, the airplane impacted a wooded valley about 5 miles north of Ramona, California. Examination of the accident site by a Federal Aviation Administration (FAA) inspector, revealed that the airplane impacted a large tree and steep terrain. The tree penetrated through the main cabin floor and roof. The main wreckage remained intact with the exception of the propeller assembly which was located near the main wreckage. The wreckage was relocated to a secure facility for further examination.